Hills have received the first snowfall of the season. It is chilly in the foothills. Weather has a profound influence on our dietary preferences. The batch of oranges that we got from the hills was sitting in the basket, ignored. With the Sun hiding behind the clouds and mercury dipping, no one was keen to have oranges. They had to be used in some recipe as they had shriveled and were almost on the verge of rotting. 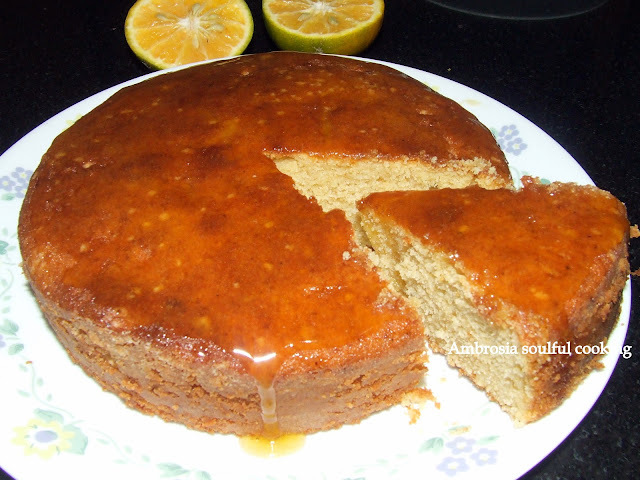 I had bookmarked a recipe – LIME BUTTERMILK POUND CAKE from the blog Passionate About Baking. With so many oranges to be used, this was the right time to try out this cake. 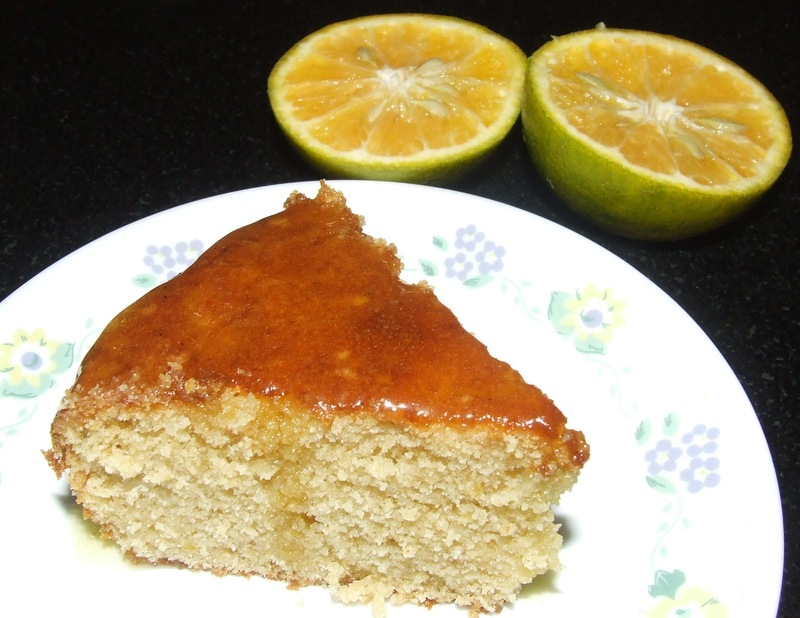 I made some changes in the original recipe, salvaged the oranges and the family enjoyed WHOLE WHEAT ORANGE YOGURT CAKE. I used whole wheat flour instead of all purpose flour, orange juice in place of lime juice and yogurt in place of buttermilk. 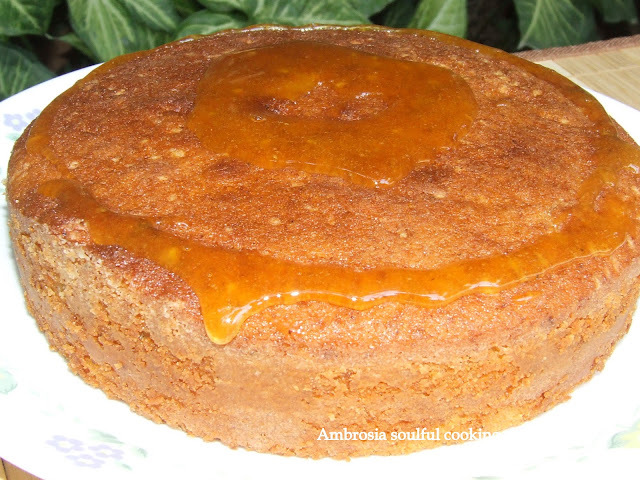 Whole wheat makes cake a little dense. But the cake tastes great and is high on nutrition! The Black Beauty! 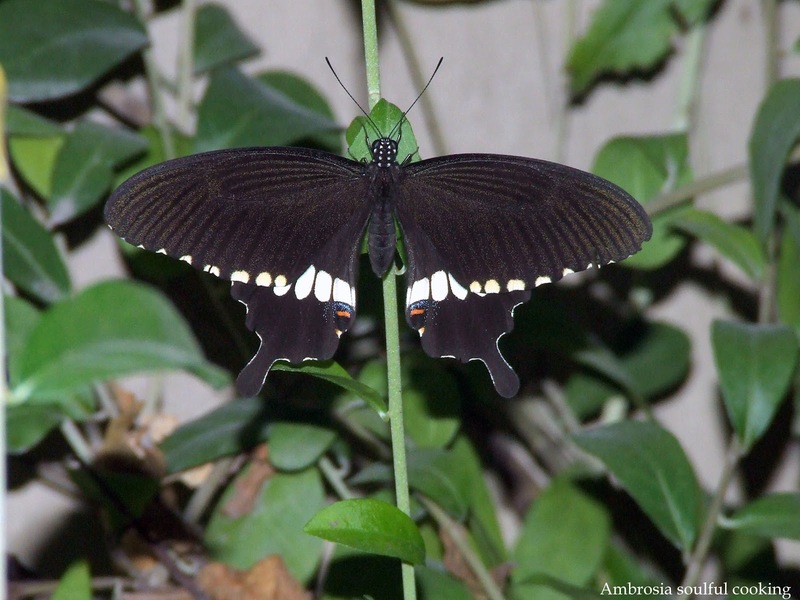 snapshot of a butterfly in our garden. Cream together butter and sugar. Add yolks, vanilla essence, orange juice, zest and mix well. Beat white of the eggs till stiff and add to this mixture. Sieve whole wheat flour with salt, baking powder and baking soda two times. Beat curd lightly till smooth. Add the flour to butter sugar mixture in three parts adding curd every time while mixing. Heat sugar and orange juice in a thick bottom vessel stirring continuously till sugar dissolves. When still warm, pierce the top of the cake with a fork or a skewer and pour the glaze on top of the cake. That looks just beautiful, and wholewheat with orange calls my name. How lucky you are to live in such a beautiful place. Oranges from the hills, the first snowfall... wow! Thank you for baking from my blog. Do all the cakes that you bake with whole wheat flour turn moist and later sticky? I my case, the crust becomes really soft and sticks to knife while slicing. This happens with me more when I bake whole wheat cakes without eggs. I will try to find out why this happens and get back to you. Love and happy baking! Hi, can you tell me the exact amount, in cups, of orange juice to be added to the batter? Hello Lina, 1 1/2 orange gives around 3/4 to 1 cup orange juice. You may adjust the quantity of juice according to the consistency of batter also. Batter should be of pourable consistency. I have used whole wheat flour so I needed more juice. Happy Baking Lina! Thank you, hoping to try out some of your delicious whole wheat flour cakes. Hi,can we add yoghurt instead of the eggs for a eggless version? Hello Binu, You may use yoghurt in place of eggs. 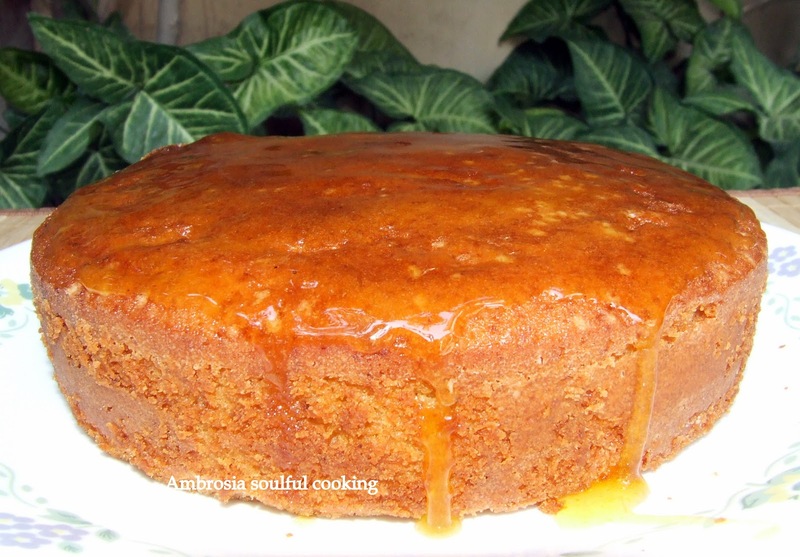 But I would recommend that you have a look at other egg less Orange Cake recipes in my blog. They are tried and tested. Happy Baking! Hi Namita can we use brown sugar instead of white sugar? Hello! yes, that would be really very healthy.